How to go from Trello zero to a Trello hero. This section is designed for everyone that’s looking to become a Trello pro. There are a ton of handy features, shortcuts, tips, and tricks to getting the most out of your everyday Trello experience. Here are some of our favorites! Trello has a ton of time saving keyboard shortcuts, which when added up we figure should equal an extra coffee break a day or more. When in Trello, hit the question mark key on your keyboard to view them all, or check out this handy list. Want to quickly view all of your cards on a board? Then Q is for you. Add yourself to cards by mousing over them and pressing the spacebar. Add others to cards with M, so all the tasks don’t belong to you. Never miss a hot date! Add due dates with the D key. Use Shift-Enter to save a card and go right to the card back. It’s like a 2 for 1 special. Bring up the label menu with L, and filter those labels with F to surface what matters most to you. Have a list that you want to import into Trello from a spreadsheet or document? Just copy and paste that list into a new Trello card, click “Add,” and Trello will ask if you want to turn each line separated list item into a separate card. #TrelloTips: This shortcut works when adding checklist items, too! When getting work done in Trello, share it with your team so that no one will have to interrupt your workday wondering the status of a task (and also to show how awesome you are, obviously). Here are a couple of ways you can show off what’s getting done. Create a “Done” list and move cards there when they are completed. It might even make sense to create a new “Done” list of each week for standups and retrospectives. If you add due dates to cards, mark them done by clicking the checkbox on the back of the card. The badge will go from angry red to soothing green... Ahh. Create a label to signify “done” (party pink perhaps?) and apply the label to completed cards.  Make a “Done” checkbox with the Custom Fields Power-Up. Drag and drop a celebratory sticker to a card when you want to share your accomplishments. Archive it! Out of sight, out of mind. Fun fact: Every one of your Trello boards has a unique email address just for you, and every single card on every board you are on has one as well. That’s basically a zillion email addresses. Mind you, we don’t just put them there for fun, we put them there for functionality. 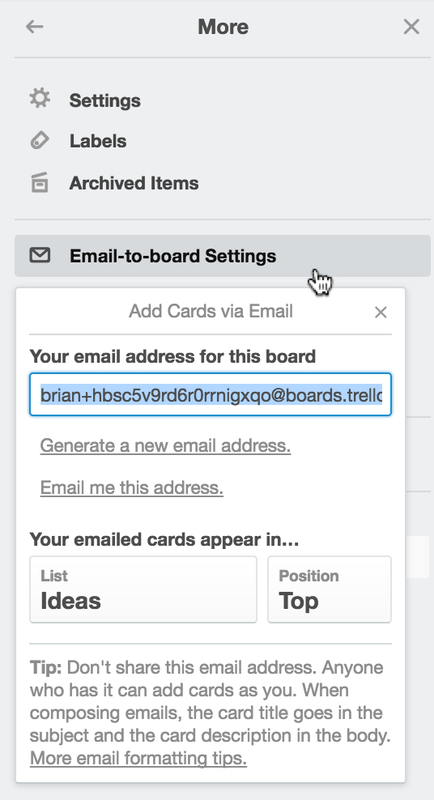 Get to inbox zero by turning emails into action items in Trello. Forward an item in your inbox to your board’s email address, and a card will be created from the email in the list of your choosing. Manage demo requests, support tickets, and job applications on a Trello board instead of your inbox to make sure nothing important falls through the cracks. Finally, got a client that wants to stick with email no matter what? Use each card’s email address to forward feedback from clients to their cards to keep everything organized in one place. Click “Share and more” on a card back to get the email address. Organize frequently visited and important boards at the forefront of Trello with starred boards. To star a board, click the star icon next to the board’s name either in the board or on the boards page. Starred boards are organized at the top of your boards page and boards menu, and can be dragged and dropped into any order you desire. Not only does this make finding those boards easier, but starred boards will also always be available offline on mobile. 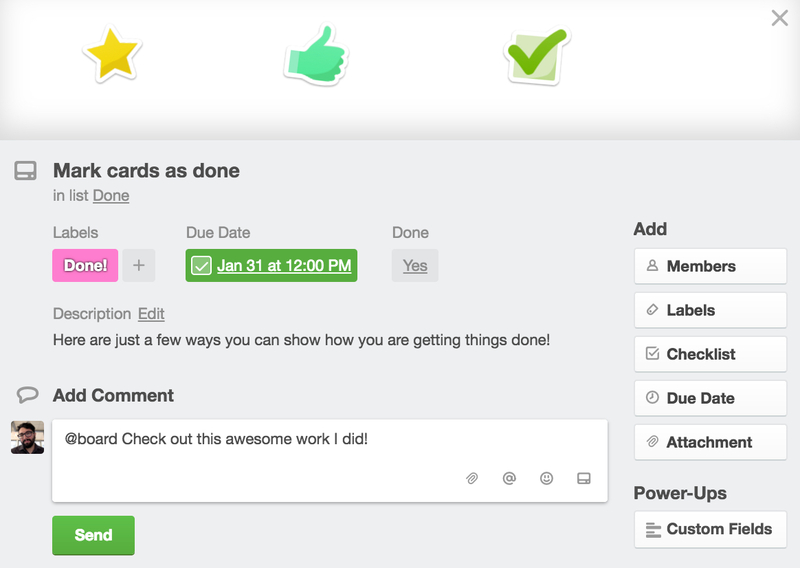 Keep track of the work you are doing across multiple boards with the Cards page. This page displays all of the cards that you are on, and can be sorted by board or due date. 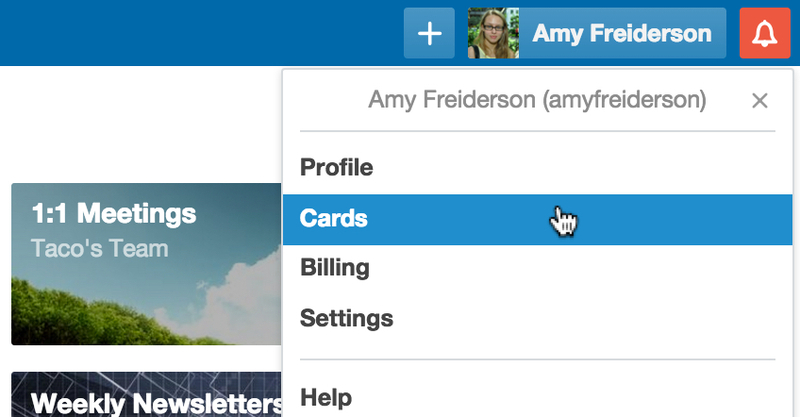 When you need to quickly find something, type it in the search bar on the top left, and Trello will display the cards and boards related to your query. Employ search operators like a fine toothed comb to really unleash the power of search in Trello. For instance, @me will return all of your cards, due:week returns all cards due in the next seven days, label:red returns all cards with a red label applied, and much, much more. Best of all, multiple operators can be used in tandem, like @me due:overdue -list:done, which will surface all of your cards that are overdue and not in a list named “Done." Business Class, Enterprise, and Gold members can save their searches for quick recall (and one less thing to remember). Hungry for even more tips and tricks? Check out our Ultimate Tips & Tricks Trello board.